Privacy Glass,20 Way Heated and Cooled Front Seats with Power Recline Heated and Cooled Rear Seats with Driver/Passenger Memory,21in 7 Split-spoke Style 7001 Silver Finish with Locking Wheel Nuts,All Terrain Progress Control (ATPC), Terrain Response 2, Interactive Driver Display, All Terrain Info Centre, Comfort Mode, Dynamic Mode and Eco Mode, Driver Condition Monitor,Bluetooth Connectivity,Cruise Control,Digital Audio Broadcast (DAB) Radio,Electric Windows with One-touch Open/Close and Anti-trap,Electrical Towing Preparation,Fixed Panoramic Roof with Auto Sun Blind,Heated Front and Rear Seats,Heated Windscreen,Hill Launch Assist,InControl Remote Premium, InControl Apps, Secure Tracker, Pro Services and WiFi Hotspot, Digital TV,Intelligent Stop/Start System,Laminated Front and Rear Side Glass,Rain Sensing Windscreen Wipers,Rear Camera, Clear Exit Monitor, 360 Parking Aid,Three-Zone Climate Control,Tyre Pressure Monitoring System (TPMS),Upholstery - Perforated Semi-Aniline Leather Seats,Voice Control,Currently available we have this Vogue SE in a beautiful Loire Blue Metallic finish partnered with a contrasting Ebony and Ivory leather interior. Hosting an array of features that include Privacy Glass, Heated and Cooled Power Recliner Seats, Meridian Digital Surround Sound System and more. Get in touch to hear all the features that this exceptional vehicle has to offer. 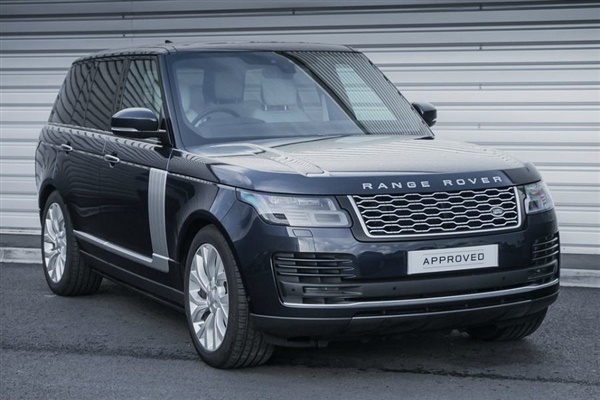 This advert is for a Land Rover Range Rover, click Land Rover Range Rover in Christchurch to see more cars like this in the local area. Want to search further afield? Click Land Rover Range Rover in Dorset to search for similar cars in the wider Dorset area.